Expectations were high for John Hunter Nemechek when he was announced as the driver of the No. 42 Chip Ganassi Racing Chevrolet for the majority of the 2018 season. 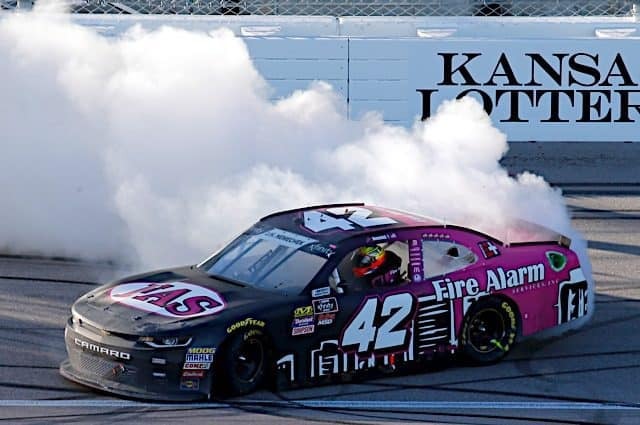 The youngster lived up to those expectations in Saturday’s Kansas Lottery 300 at Kansas Speedway, winning his first career XFINITY Series race. Nemechek began the race from 13th, but after missing a Turn 1 incident on the last lap that collected eight cars in front of the No. 42, he rocketed up the leaderboard. In a wild stage one, Nemechek finished second, just behind Daniel Hemric. Early in stage two, Nemechek got around the No. 21 machine en route to the stage victory — his second of the season. But it was a few mistakes late in the final stage that set Nemechek up for a shot at the victory. With less than 50 laps to go, Nemechek ate into Hemric’s lead entering pit road. However, he overshot his pit stall, costing him three seconds on the lead. A caution with 36 laps to go for Vinnie Miller‘s stalled car was the saving grace for Nemechek, as it closed the gap on the lead, but the crew failed to get all the lug nuts tight on the left front tire. Nemechek had to come back into the pits and restart sixth. By the end of the first lap after the restart, Nemechek was up to third. Two laps later, he was the race leader, where the No. 42 would cruise to the victory. It’s the sixth victory of the season for the car and qualifies it for the owner’s championship race at Homestead-Miami Speedway next month. The aforementioned Hemric finished runner-up yet again. A two-tire pit stop late in the race moved Elliott Sadler to third, while Shane Lee and Tyler Reddick rounded out the top five. Matt Tifft, Ryan Reed and Ty Majeski were the only other drivers that finished on the lead lap. Though it took 15 races, John Hunter Nemechek won his first career XFINITY race, and it had more meaning than others. In 2004, Joe Nemechek, John Hunter’s father, swept the weekend at Kansas Speedway, edging out Greg Biffle in the XFINITY race, before nipping Ricky Rudd at the finish line the next day in a near photo finish. Those were Joe’s last two wins in each series, respectively, and John Hunter was in Victory Lane for both as a child. Fast forward 14 years, the younger Nemechek stamped his name into the record books as an XFINITY winner. Coming into Kansas, he had three top fives and seven top-10 finishes in 14 races. Meanwhile, Ross Chastain, who only piloted the No. 42 Chevrolet in three races this season won at Las Vegas and finished second at Richmond. Had he not got into an incident late in the going at Darlington with Kevin Harvick, it’s likely Chastain would have won two races in the same equipment that Nemechek had been running for the majority of the season. Sure, Nemechek is a rookie running a part-time schedule and Chastain is in his fourth full season in the series, but there was pressure on the 21-year-old. Prior to leading 64 laps on Saturday, Chastain had led over five times the amount of laps as Nemechek in the same ride. Now, Nemechek’s total is up to 120 for the season. Prior to the win, there was a lot of rumors on what Nemechek’s future was going to be, and there likely still is. CGR officials are high on Chastain, as is Jeff Carpoff, President and CEO of DC Solar. It takes money to run in NASCAR — especially in top-tier equipment, and currently, Ganassi only fields one XFINITY car. Now that both Chastain and Nemechek are proven winners in the XFINITY Series, there will be tough decisions over the next few months on who gets the nod as the driver of the No. 42 car. This was a must-win race for Nemechek, and he delivered. Will Daniel Hemric ever win an XFINITY Series race? With how close the No. 21 team has been this season, it seems like the elusive first-career victory is right around the corner. But Hemric saw another checkered flag slip from his grasp late in the race at Kansas. Hemric dominated the event, leading a race-high 128 laps. The No. 21 was the fastest car on the track all weekend long — both practices and winning the pole by two-tenths of a second. Meanwhile, when it came down to crunch time, the air pressure adjustments that Danny Stockman made on the No. 21 during the final pit stop were the wrong adjustments for the car. After the aforementioned yellow for Miller’s stalled car came out, Hemric’s three-second lead on John Hunter Nemechek was erased. The No. 21 executed on pit road, though the car didn’t handle well for the sprint to the finish and Nemechek pulled away over the final 30 laps. “I thought the restart didn’t really go that bad, I was just loose that last run,” Hemric said after the race. “I had a vibration the last 15 laps. I don’t know if I had a tire that was equalizing, but I felt like I had five pounds more of right rear spring than I had all day. Hemric edged out Elliott Sadler for second, his third such finish this season. But in order to hoist the championship at Homestead, you’d think the driver would have to win a race during the year as stout as the competition has been this year in the XFINITY Series. Sure, it’s another top five, but it’s the third straight race where a potential win slipped out of Hemric’s hands. But don’t forget, he’s moving to the Cup Series in 2019 without winning in either the Camping World Truck or XFINITY Series. To make matters worse, the left front corner of Hemric’s car was found to be too low in post-race inspection Saturday. He’s looking at a points penalty being announced in a few days. That penalty could cost him the points lead going into Texas. In order to finish first, first you must finish, and three of the eight playoff drivers couldn’t make it out of Turn 2 of the first lap of the race. While Daniel Hemric gapped the field on the initial start of the race, Justin Allgaier made a move under Christopher Bell for second. The No. 7 car got loose, sliding up the track into the No. 20, causing an eight-car melee, involving Austin Cindric, Cole Custer, Ryan Truex, Chase Briscoe, Spencer Gallagher and Michael Annett. Allgaier and Cindric weren’t able to turn another lap, finishing 38th and 39th. Bell turned one lap so that he could gain one point on the No. 7 car toward the championship, finishing 37th. Fortunately, both Allgaier and Bell have had the quickest cars all season long, winning 11 races combined. However, since the start of the playoffs, Allgaier’s performance has plummeted, with two DNFs and three finishes outside the top 10 in four races. The inconsistency that haunted the No. 7 car during the first 10 races of the season has returned. 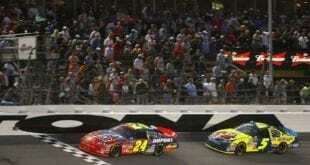 Bell lost over 30 points on the cut-line, though he is still fourth heading into Texas Motor Speedway in two weeks. However, Cindric is in a must-win scenario at TMS or ISM Raceway, sitting 43 points behind the transfer position to Homestead. Custer managed a 26th-place finish, though he was 19 laps down at the finish after losing his power steering. With the early trouble to more than a handful of top XFINITY teams, the floodgates opened up on potential good runs for smaller race teams. That’s exactly what happened with finishing positions nine through 20. It was announced earlier in the week that Quin Houff would pilot the No. 15 JD Motorsports ride for the remainder of the 2018 season. He backed that up with a 14th-place finish on Saturday. Houff began the race in 31st, equaling his worst qualifying effort in seven career XFINITY races. He chugged through the field, finishing 23rd in Stage No. 1. In Stage No. 2, he moved up the leaderboard to 16th. During the second half of the race, which for the most part went caution free, Houff passed Ryan Preece (blew a left rear tire) and Joey Gase to finish 14th — tying the best finish of the season for the No. 15 car, as Katherine Legge also finished 14th at Road America in late August. Ryan Sieg (ninth), Jeremy Clements (10th), Alex Labbé (12th), Garrett Smithley (13th), Joey Gase (15th), Chad Finchum (16th), David Starr (17th), JA Junior Avila (18th), Spencer Boyd (19th) and Josh Bilicki (20th) all had solid finishes for their teams respective budgets. As for the entire postseason, drivers running for Monster Energy NASCAR Cup Series points weren’t allowed to race in the XFINITY race. However, there was a trio of drivers who will run in the Cup race on Sunday. BJ McLeod was the highest finishing of the three in 23rd. Chastain had a tough day, which included losing his hood during green flag racing. JJ Yeley piloted the newly formed No. 37 for RSS Racing, owned by Ryan Sieg and start-and-parked to a 35th-place finish. Who would have predicted that Kansas Speedway was going to host the wildest race of the XFINITY Series playoffs? Certainly, not me. With the madness, no drivers clinched a spot into the championship race at Homestead, though some helped and hurt their chances. Heading to Texas Motor Speedway in two weeks, Daniel Hemric is the points leader, 23 points above the cut-line. Elliott Sadler is +14, while Tyler Reddick is +11. Christopher Bell holds the coveted final transfer position, with a one-point buffer on Matt Tifft. Justin Allgaier, a five-time winner in 2018, is five points below the cutoff, with Cole Custer -23 and Austin Cindric -43. The XFINITY Series will have its second off week in the last three weeks next weekend. The series will pick up for a three-race stretch to the end of the season at Texas Motor Speedway on Nov. 3, where the last full-time XFINITY driver to win at was Chase Elliott in 2014 — his first career victory. In the spring race this year, Christopher Bell was the highest finishing series regular in second. Heartbreak? At least it saved nascar from having to explain – again – why they let a guy with a illegal car keep a win.